The intent was to define a territory by creating a product for a specific place. The area selected was an island of trees in the middle of a field in the French countryside. The product was a structure devised to hug two trees like a corset. The rope around the trees represented a set of ribs and the rope holding the poles was the corset ribbon. There was also a desire to promote a sense of security for tree-climbers in the area. In order to do this, rope was crossed over both openings between the two trees. 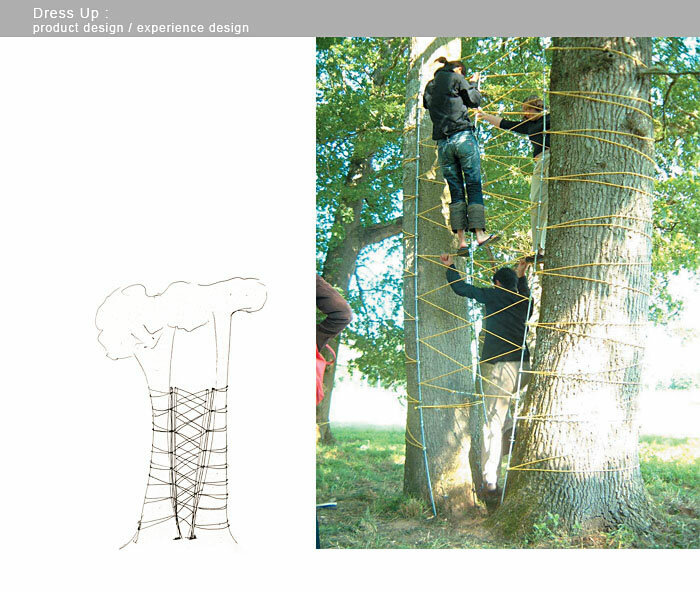 This way, a person could climb on the outside of the structure, or on the inside, with the two trees acting as support. This week long project was of a study abroad program design workshop offered by the Vitra Design Museum at the Domaine de Boisbuchet.